As the weather slowly starts to get warmer, we have been enjoying more time in the garden. Our Committee has successfully applied for a grant from the October Fund which we are using to finance some fantastic new resources to support learning outside including two purpose built sheds (one for literacy and numeracy and one for sand and water play) so that children can help themselves to pencils, paper, measuring sticks, jugs, funnels or whatever they need to enjoy their learning in the garden. We have also had some interesting visitors to Playgroup this term. The first was an Ofsted inspector who spent the day with us on 20th March assessing our provision. We are delighted that following the inspection we have retained our “Good” rating. If you would like to read the report it is available on https://www.gov.uk/find-ofsted-inspection-report . Our other visitors were decidedly more fluffy: we hatched 10 chicks from the Living Eggs project this term. The children saw several of the chicks hatch and really enjoyed giving them names and watching them in their brooder. The staff also supervised the children holding and stroking the chicks helping them to learn about caring for animals and the importance of washing their hands afterwards. Waterbeach Feast is on Saturday 8th June. Our theme for Feast this year is Minibeasts. Look out for emails in the coming weeks about arrangements for the Parade and our fundraising stall. CI Photography will be coming in to Playgroup on Friday 14th June to take group photos. If your child doesn’t usually come on a Wednesday morning but would like to be included in the photos, please speak to Jacqui or Fiona. We will have two group photos, one for everyone and the other a leavers’ photo, just for children going up to school this year. Waterproofs and wellies – Please remember to send your children’s wet weather clothes in in their drawstring bags. 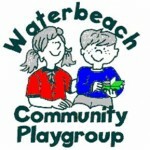 These can be stored at Playgroup – or taken home each day. Please keep sending your child with spare clothes as water play is always available too and please check to see if the clothes in your child’s bag still fit them. Please don’t send your child in crocs, flip flops or other loose fitting shoes as they are not suitable for climbing on the Play structure. Sun Safety – As the weather gets warmer, please apply sunscreen to your child before they come to Playgroup. You can leave sunscreen with your child’s Key Person to top up during the day. Please leave a long sleeved t-shirt and sun hat in your child’s bag during the summer too. For safety reasons we regret that children are not allowed to wear sunglasses in session. Please label all your child’s belongings as this really helps staff. Parent Rota We welcome parents and carers to come in and help at one of their children’s sessions. We really appreciate the help and it is a nice way to understand your child’s experience at Playgroup and get to know their Key Person. Please look out for our Parent rota on the notice board if you would like to join us for a session. Parents can also join us at their child’s Forest School session, please speak to Jacqui or Fiona if you are interested. Thursday 18th July – Summer Term Term closes.